The CI327 is destined to be a silent low-power media center for streaming and browsing with its wide range of video outputs and USB ports. The Zotac ZBox series consists of a wide range of mini PCs from passively cooled solutions all the way up to hulking VR Ready Magnus desktop replacements. The latest entry is of the former variety with its super small dimensions and low-power 6 W Intel processor that allows for a fanless design. The miniature design incorporates ventilation and air holes on nearly every side to ensure safe operation even on the most demanding of tasks. 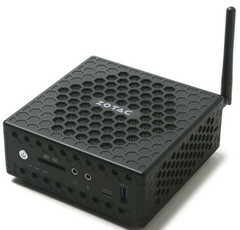 Zotac has provided no other information regarding the launch price or availability of the ZBox CI327, but at least one retailer is already listing the model as a barebones (no RAM, no OS, no storage) offering for $200 USD.